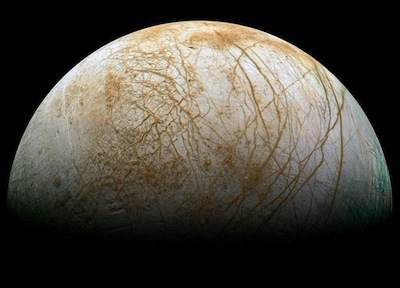 NASA plans to use funding proposed by the Obama administration to narrow concepts for a billion-dollar mission to Jupiter's icy moon Europa, according to NASA officials eyeing a launch of the long-awaited probe in the mid-2020s. The space agency's top planetary science official said the recent discovery of watery plumes erupting from Europa's south pole gives greater impetus to a mission there. It would provide researchers a chance to sample the moon's global ice-encrusted ocean without having to drill through its thick ice sheet, an endeavor which would inevitably drive up the mission's cost and complexity. NASA's Galileo spacecraft surveyed Jupiter and its moons, including Europa, from 1995 to 2003. But scientists say they are better equipped now to build a mission focused on Europa to return better results, and for less money, than Galileo. The $15 million in the White House's fiscal year 2015 budget request marked for the Europa probe would be added to the $155 million already appropriated by Congress in 2013 and 2014 for early work on such a mission. Congress awarded that funding even though NASA never asked for the money. Given the strong congressional support for the mission, it is likely lawmakers will approve Europa funding next year at least in line with NASA's request. "For the last several fiscal years, the president's budget to Congress has not included any funding to begin formulation of plans to go to Europa," said Jim Green, director of NASA's planetary science programs, in an interview March 7. "So Congress has put that money in. This year, the administration has decided to do the same. This is a big deal." NASA Administrator Charlie Bolden said March 5 that officials envision a mission to Europa with about the same cost as the agency's New Frontiers line, which carries a cost cap of approximately $1 billion. NASA has launched two New Frontiers mission to date, with the New Horizons probe on the way to the first flyby of Pluto and the Juno spacecraft cruising to Jupiter. Another New Frontiers mission, OSIRIS-REx, is due for launch in late 2016 to return samples from an asteroid. Green said that while NASA aims to design a Europa probe in the mold of a New Frontiers mission, it will be a standalone project. The National Research Council's planetary science decadal survey, which sets NASA's strategy in robotic exploration of the solar system, outlined specific concepts the space agency will choose from when crafting the next New Frontiers program. "Everyone has been saying New Frontiers-class, but what they really mean is at about a billion dollars," Green said. "Could we really do Europa science at about a billion dollars?" Engineers could design the spacecraft to be solar-powered instead of putting plutonium power generators on the probe, a design change that would cut costs. International partnerships are also an option, officials said. 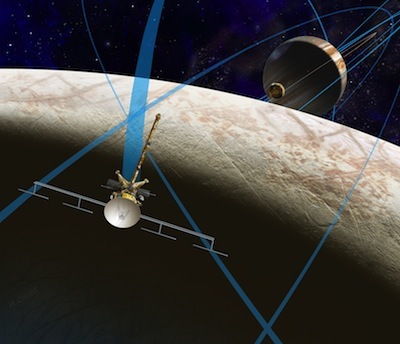 The least expensive mission currently under study is a concept named Europa Clipper, which would fly by Europa 45 times in the late 2020s and early 2030s. Europa Clipper was born out of the $155 million congressional appropriation over 2013 and 2014, which drove engineers to reduce the scope and cost of the Europa probe, which was ranked as the second-highest priority for NASA's planetary exploration program by the National Research Council in 2011. The European Space Agency is developing its own Jupiter mission scheduled for launch in 2022. The Jupiter Icy Moons Explorer, or JUICE, will pass by three of Jupiter's largest moons, including Europa, before entering orbit around Ganymede. NASA's Juno mission, which launched to Jupiter in 2011 and is set to arrive in 2016, will not fly by any of the giant planet's moons. The U.S. decadal survey report in 2011 estimated the cost of a Europa probe at $4.7 billion. Green said such a costly mission was simply too expensive, so scientists directed the agency to find a cheaper option. Teams based at the Jet Propulsion Laboratory led the studies. "When funding came from Congress, that's the first thing we turned our attention to," Green said. "We began to see, based on input from the decadal, how we might be able to lower the cost, and we looked at three options: an orbiter, a lander and something that's doing multiple flybys. "We recognize already that the lander is way too expensive because of what we need to know before you can put a lander down," Green said. "We have to do some of the other options first, so we investigated an orbiter. Europa is in a really tough radiation environment, so in the meantime, we looked at how can we do global science that an orbiter provides but not get into orbit. Can we do that with multiple flybys?" Green said scientists can learn a lot from flybys, citing NASA's experience with the Cassini mission, which completed its 100th encounter with Saturn's moon Titan in early March. "My gosh, that's a big deal," Green said. "In 100 flybys, we see the hydrological cycle, we see the lakes now appearing in the southern hemisphere, and we have observed methane rain on Titan. We're getting a global perspective by creating multiple flyby opportunities." 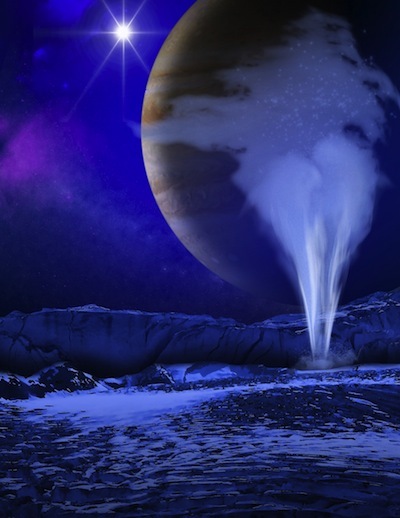 Scientists announced in December they found strong evidence of jets of water above Europa's south pole, and Green said that discovery refocused NASA's studies on finding the best mission to address the plumes. The discovery of the plumes drove NASA to ask "what out of our concepts could take advantage of flying through the plumes," Green said. "Is the orbiter or the multiple-flyby option in a better position to be able to study the plumes, make measurements, actually get samples, analyze those and be able to tell us what's in those? Is it just water, are there organics, what is Europa processing and how is that ocean communicating with the surface?" The Europa Clipper concept, which carries a cost of about $2 billion, was designed before the plume discovery. "Clipper wasn't designed to fly through plumes with the right instruments," Green said. "We're in the process of validating that. We're in the process of asking what could have Clipper done, or do we need to follow up with Clipper to do that. That's one option, but we're also looking at what can we do of value with the plumes at an even lower cost. We don't know for a fact that we can, but that's what pre-formulation is all about. Let's study that."